In the coming days, Americans will follow a single event across a variety of media channels: the inauguration of Donald Trump as the 45th president of the United States. If the public’s media habits during the campaign are any indicator, it is likely that Trump and Hillary Clinton voters will be learning about the inauguration from very different media outlets. According to a new Pew Research Center survey, Americans who say they voted for Trump in the general election relied heavily on Fox News as their main source of election news leading up to the 2016 election, whereas Clinton voters named an array of different sources, with no one source named by more than one-in-five of her supporters. The survey was conducted Nov. 29-Dec. 12, 2016, among 4,183 adults who are members of Pew Research Center’s nationally representative American Trends Panel. When voters were asked to write in their “main source” for election news, four-in-ten Trump voters named Fox News.1 The next most-common main source among Trump voters, CNN, was named by only 8% of his voters. Clinton voters, however, did not coalesce around any one source. CNN was named more than any other, but at 18% had nowhere near the dominance that Fox News had among Trump voters. Instead, the choices of Clinton voters were more spread out. MSNBC, Facebook, local television news, NPR, ABC, The New York Times and CBS were all named by between 5% and 9% of her voters. 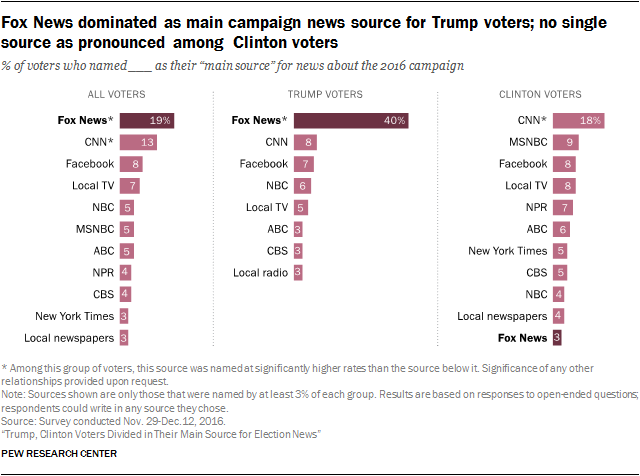 What’s more, though Fox News tops the list of sources among Trump voters, only 3% of Clinton voters named it as their main source. And while MSNBC was named by 9% of Clinton voters, only 1% of Trump’s voters relied most on that network. The New York Times and NPR were also much more commonly named by Clinton voters than Trump voters. These findings are consistent with past research revealing that those on the right and left have significantly different media diets, with Fox News in particular standing out among conservatives. But some sources are about equally likely to be named by voters on both sides. This included two of the broadcast news networks (NBC and CBS) and Facebook, even though the social media site is not an organization that produces its own news. Nearly one-in-ten of both Trump (7%) and Clinton (8%) voters said Facebook was where they got most of their news about the campaign – though it is likely that the specific news outlets that filled their Facebook feeds differed substantially. Overall, 8% of voters named Facebook as their main source for election news, outpaced only by Fox News (19% of voters) and CNN (13%). The “main news sources” mentioned by at least 3% of each voting group stand out in another way: they consist entirely of longstanding national news brands – cable and broadcast TV, newspapers, radio – along with local media and Facebook. The digital news publishers that played prominent roles in the campaign did not appear to serve as main news sources for either Trump or Clinton voters. This notably includes Breitbart (named by 1% of voters), an early supporter of Trump’s campaign; BuzzFeed, which broke a number of stories over the course of the election (named by no voters in our sample); and The Huffington Post, which added an editor’s note calling Trump a “liar” to any articles about the Republican candidate during the election – though it has since stopped the practice (named by 1% of voters). The study also suggests that Democrats who backed Bernie Sanders or another Democratic candidate in the primaries prioritized, to some extent, different types of news media than those who supported Clinton – even once the general election had begun. There were fewer differences between those who did and did not support Trump in the Republican primaries. Democrats and Democratic-leaning voters who supported Clinton in the primaries named MSNBC, local TV and Fox News at higher rates (13%, 12% and 4% respectively) than Democrats who did not support Clinton. Among Democrats who did not support Clinton during the primaries, on the other hand, 4% named Reddit – an online forum with a sizable presence of Bernie Sanders supporters and which, like Facebook, does not produce news – compared with no Democratic respondents who supported Clinton in the primaries. These differences in media use between the primary supporters of Clinton and those of other Democratic candidates are consistent with the age profiles of both groups of supporters. On average, Clinton’s primary backers were older than Democratic voters who backed Bernie Sanders, and – on the whole – older Americans are more likely than younger Americans to turn to television and print sources as their main sources of news. Among Republicans, the same sources rose to the top for both Republican voters who had supported Trump in the primaries and those who supported a different candidate. Only one source – Breitbart – differed in its usage between the two groups, and even it was not named as a main source very frequently. The 10-year-old digital news outlet was named by 3% of Republican voters who supported Trump in the primaries, but less than 1% of those who supported someone else in the primaries. These intra-party differences were even more pronounced when it came to the platform through which Americans got most of their general election news. Republican voters were unified in where they got most of their news about the general election; voters who had supported Trump in the primaries and those who did not used TV, print, radio and digital sources at about the same rates. Among Democrats, however, the differences were stark. Over half of Democratic voters who had supported Clinton in the primaries (56%) got most of their general election news from television. But this falls to 37% among Democrats who had supported someone else in the primaries. Instead, these Democrats were more likely to say they got most of their general election news from either news websites or social networking sites (48%, compared with 28% of Clinton-supporting Democrats) – though again, age played some role here. Overall, the data also show the dominance of TV as a main source for campaign news. A majority (54%) of voters said they got most of their campaign news from television. This mirrors findings from early 2016, when Americans were most likely to name cable TV as the most helpful source for learning about the election. Television is also Americans’ most common source for news more generally. While no digital-native news publisher stood out on the list of voters’ main source of news for the 2016 election, it’s clear that some did turn to these sites as part of their overall news diet. In addition to asking respondents about their “main source” of campaign news, the survey also asked respondents to look at a list of news outlets and identify any that they used “regularly” for news about the campaign. Included on this list were six digital news websites – a mixture of aggregators and original news publishers – whose audiences are situated at different points along the ideological spectrum, according to past research.2 Across these sites – Google News, Yahoo News, The Huffington Post, Breitbart, BuzzFeed and Drudge Report – Americans indicated modest levels of use. About one-in-five voters overall regularly got election news from Google News (18%) or The Huffington Post (17%), while 12% did so from Yahoo News. Less than one-in-ten regularly used BuzzFeed (7%), Breitbart (6%) or Drudge Report (6%) for election news. However, some of these sources were more prominent among one candidate’s supporters than the other. 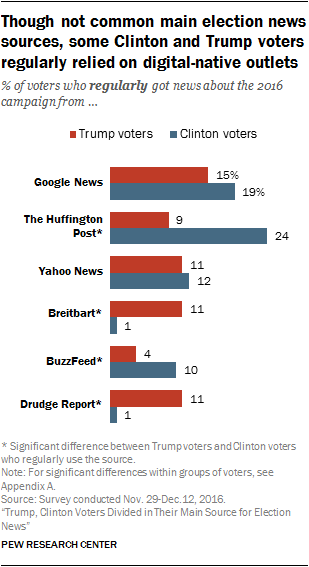 The Huffington Post was used regularly for election news by nearly a quarter (24%) of Clinton voters, but only about one-in-ten (9%) of Trump voters. BuzzFeed also showed higher usage among Clinton (10%) than Trump voters (4%). Conversely, both Breitbart and Drudge Report reached 11% of Trump voters but a mere 1% of Clinton supporters. In terms of primary support, a greater divide is again evident among Democrats than Republicans. 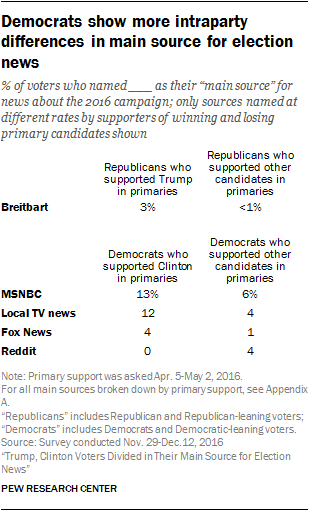 Among the six digital-native sources asked about, Republicans only differ in their reliance on Breitbart: 16% of Republican and Republican-leaning voters who supported Trump in the primaries used Breitbart regularly for campaign news, compared with 8% of Republican voters who supported someone else in the primaries. But for Democratic voters, four of the six sites were more likely to be used by voters who didn’t support Clinton in the primary than those who did: The Huffington Post, BuzzFeed, Google News, and even Breitbart (though only 3% of Democrats who supported another candidate in the primaries regularly got news from this site).